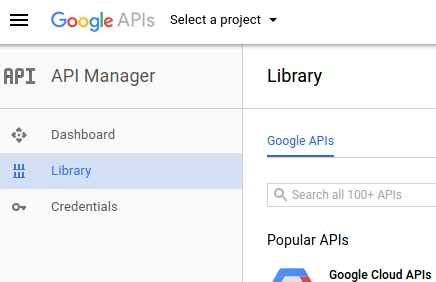 Register a Google Application and enable Calendar API. In your web application, request user for authorization of the Google Application. Use the primary calendar of the user. Or else get the list of his calendars and let the user choose. Create an event on this calendar. This tutorial covers version 3 of Calendar API. Google also provides a PHP Client Library through which you can make Calendar API calls, but is is 6 MB in size. It is better to write custom code, about 100 lines, for small API requirements. Create a project by clicking "Select a project" (at the top), and then clicking on the "+" button in the dialogbox. In the next screen enter your project name, and agree with the Terms and Conditions. Click the Library tab on the left. Search for "Calendar API" and enable it. By enabling "Calendar API", your Google application can get access to the user's Calendar. Now click on Credentials tab on the left. In the next screen click on "OAuth consent screen". Fill out the mandatory fields. Save it. In the next screen fill out the name. 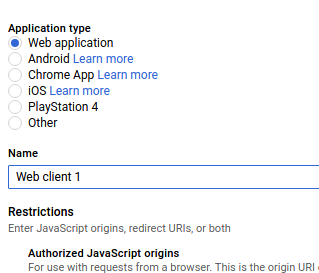 The Application type should be "Web application"
Add a redirect url in the section Authorised redirect URIs. This url should point to your redirect url script. A redirect url is the url where Google redirects the user after he authorizes your Google Application. You can even add a localhost url if you want. On success you will get the App Client ID and App Secret. Save those as they will be required later. After the user authorizes your Google Application, he will be redirected to your given redirect url. Google passes an authorization code as a GET parameter named code. You must use this code and make an API call to get an access token. Check out Google Login API with PHP Curl for a detailed tutorial about Login with Google. 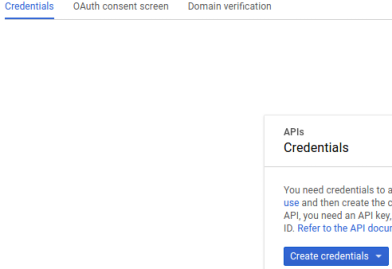 Remember, the login process is common for all Google REST APIs. All you need to do is to pass a different scope (depends on which API you are using). It also covers how to get a refresh token, through which events can be created even if the user is offline. So, at the end of this step you have got the access token. You can use this access token to make API calls to get user calendars, create events etc. The wisest soluion would be to get the default timezone of the user's Google Calendar. You can rest assure that user would have a habit of creating events in this timezone. You can only create an event on a user calendar. That is why you need a specific calendar ID. Each user has a default calendar. In addition to that, user may also have created extra calendars. Otherwise you can get the list of the user's calendars of which he is an owner. (Google Calendar provides some calendars like Holidays of which the user is not the owner). You can also get the timezone of each calendar. Your application can ask the user to choose a specific calendar, through which you can get its ID. Remember, primary is the ID of the user's default calendar. Your application need not get the list of user's calendars if it wants to create an event on the default calendar. Now that you have got the calendar ID, you can create an event. The above code handles only events running for a specific time / full day. There are also many other options that you can set through API like recurring events, attendees etc. See the full event options here.